If the Atlantic lock were pulled apart first, as suggested as one possibility of the Commission, the transmission of loads between visor and superstructure would change. The Final Report (5) has no calculations, where different attachments are not active. Without the Atlantic lock a vertical load P1 on the visor is transmitted to the hull via the side locks and the hinges. It works very well. Just because one lock fails due to one big wave impact, it doesn't mean that other locks will fail due to further wave impacts. It is easy to demonstrate that a vertical upward load P1 on the visor is transmitted as a horizontal force 0,42*P1 at every attachment point (two side locks, two hinges). There is tension in the side locks and compression (and bending) in the hinge arms (again we ignore that much external load is transmitted to the superstructure as friction in the vertical rubber seals). See figure 3.8.0 below. You see that the Atlantic lock was not required. The visor was still attached by four strong points. Visors were built in such a way in the 1950's and 1960's and it was only to unload and to reduce wear and tear in the hinges, why an Atlantic lock was later installed - to un-load the hinges! The Commission states (see chapter 15.3 in the Final Report (5)) that the load-carrying capacity of the bottom lock was insufficient to satisfy various requirements, but in fact the bottom lock was not required at all. The Commission invented that the Atlantic lock was required for the safety of the ferry while in reality it was only an extra reinforcement to unload the hinges. If the Atlantic lock was broken (at 00.55 hrs? ), the horizontal loads in the side locks were reduced (from 0.625*P to 0.42*P1), but the direction was changed - P1 caused a tensile load in the side lock lugs. The Commission then states in the confusingly written Final Report that another impact load P1 (at 01.05 hrs?) on the visor caused another tensile load that pulled the side locks apart, i.e. the side lock lugs were ripped off out/sidewards with parts of the visor aft bulkhead plating. Of course there is no evidence for that. It is another invention of the Commission! We are told that the 60 mm thick side lugs and pieces of visor bulkhead plates were pulled off the visor, but we do not told why (The lugs (each with a piece of plate from the visor) were never salvaged - they are still down at the wreck). According to the Commission this event may have occurred, when the visor was pushed up by another impact load P1 on the visor at about 01.05 hrs - 10 minutes after the damage to the Atlantic lock, or that it was a simultaneous happening. The Final Report is very unclear as shown in 3.7 - it could also have been the port visor hinge or side lock that broke off first according to the Commission. 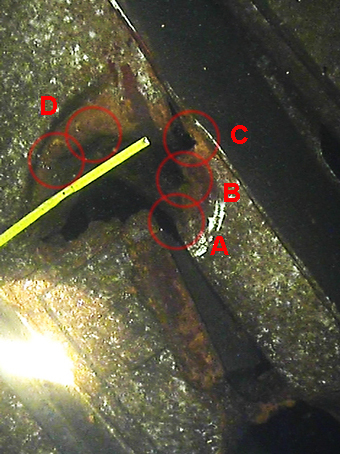 The port side lock lug and plate attached to the wreck were filmed on 2 October 1994 (see figure 8.17 in (5)) - the depth indication has been edited away. But the starboard side lock lug and plate, located about five meters deeper down were apparently not filmed on 2 October. First on 9 October 1994 was the starboard side lock lug allegedly filmed - see figure 8.18 in (5) - at 67.6 meters depth. However - strangely enough the Commission/Karppinen did not film the starboard superstructure bulkhead just above the side lock on 9 October 1994. Just above the starboard side lock Czech divers filmed in August 2000 a big opening apparently caused by an explosion 3.10. For unknown reasons the big damage above the starboard side lock is not mentioned in the Final Report (5) at all. Figure 8.18 in (5) is cut off - you cannot see what is above the side lock. The Commission has reported that the starboard front bulkhead of the superstructure is undamaged above the side lock - it is only at the top that the bulkhead connected to the weather deck is allegedly torn open a little (by the visor hydraulics). In reality there is a big opening - 0,6 meters wide and >2 meters long in the bulkhead! The German group of experts long suggested that the side lock lugs were ripped off, when the visor tipped forward - full of water and with the hinges ripped apart - and rotated around the then undamaged Atlantic lock (it was thus engaged). This suggestion has never been investigated by the Commission. This proposal is quite ridiculous as the Germans never explain how first the hinges and then the side locks can be ripped apart in a forward direction. What force would have caused that? Later, 1999, the Germans suggested 3.18 that an explosive device between visor and ramp may have contributed to the loss of the visor, i.e. all locks and hinges should have been ripped apart by a bomb exploding between ramp and visor. This is also quite ridiculous - what would have been the purpose of such a criminal act? "The visor side locking lugs remained in their recesses in the front bulkhead of the ship, located on their locking bolts. The port side lug had rotated as far as it could in the recess in a direction indicating an intial upwards movement of the attachment. The bottom face of the starboard lug was pointing out from the recess (Figure 8.18 (of (5)) indicating only a slight rotation in the same direction as the port lug. ... A hole due to an impact by the lugs of the starboard manual lock was noted in the bulkhead just above the starboard side lock." Czech divers checked and filmed the starboard side lock recess in August 2000 - figure 3.8.1 right. They found the locking lug in the recess, apparently located on its locking bolt. In figure 3.8.2 you clearly see the bottom face of the lug pointing out. However you can also clearly see that the plate edge of the upper part of the recess has been pushed and buckled upwards (!) and that as a consequence the bulkhead plate has fractured side ways. The Final report (5) does not report these strange damages. The photo in figure 8.18 of (5) taken on 9 October 1994 has been cut not to show the damaged area. According to the Commission the area was undamaged! How to explain these unreported damages? They seem to have been caused by the visor lug plate pushing against the edge of the hole in the frame plate, but the visor lug is fixed on its locking bolt. The answer will be found by studying the photos of the recess taken on 2 October 1994 (unless they have disappeared?). One suggestion is that the starboard side lug was not in a locked position and that the damage was caused by the visor moving upwards. It could have happened, e.g. if the visor side lock was not locked at sea - and that the starboard hinge then broke off, when the lug was free to move upwards and to damage the upper edge of the recess. The lug must then have been removed from the visor (see figure 8.20 from (5) reproduced below) later and locked (or located) (!) into the recess. The problem with this scenario is that according to the Commission the visor was still not found on the 9 October 1994. It was located 1 560 meters West of the wreck on 17 October 1994. The side locks could very well have been damaged in port, while trying to open the visor with the hydraulics and with the side lock engaged. The hydraulic forces on the visor hinges then pull out the side lock plates exactly as shown below. This has happened before - the Swedish Ferry 'Diana II' had similar damages in December 1993. But it does not explain the damage to the top of the starboard recess hole. By studying the visor itself it is easy to conclude that the damages port and starboard are different. Fig. 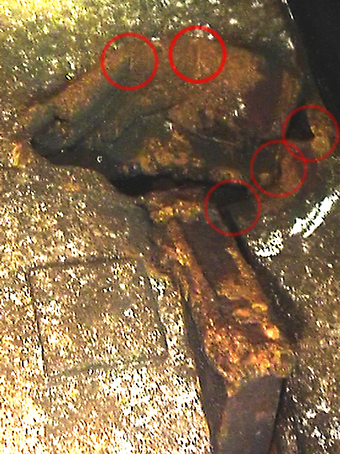 8.19 of (5) Damages to port side lock lug. The manual lock hook below. On port side (picture left) the steel plate below the side lock lug is pulled out resulting in a rectangular opening. The fractured edges are not rusty. The double plate hook plates of the port manual lock below the side lock lug are pushed together sideway, i.e. it could not have been used. On the starboard side (picture right) the lug is evidently missing resulting in a rectangular hole, but the plate is also ripped open outside the hole. The fractured edges are rusty. The starboard manual hook/lugs are ripped apart and deformed vertically/aftward.The reason for this damage is unclear - the Commission suggests that they punched a hole in the front bulkhead but the Czech divers did not find that hole - they found instead a 2,5x0,6 meters opening caused by explosives - see below and 3.10. The Commission states in the Final report (5) that the manual side locks were not used, but the damages to the starboard manual lock hook evidently show that it must have been used or damaged, when the visor was removed. Fig. 8.20 of (5) Damages to starboard lock lug. The manual lock hook - damaged - below. The starboard manual side lock was probably engaged (locked! ), because the ordinary, hydraulic side lock above was already damaged before the accident and could not be used. On other photos, e.g. right taken immediately after the salvage of the visor, the manual hook is however undamaged! The starboard hook - undamaged - is seen left in the picture. The writer originally thought that the loss of the side lugs were caused by a sideway wave force, when the leaking and listing ferry hit the visor sideways straight down on a wave. This would have been easy to confirm by checking the lugs - scrape marks, but the lugs are still on the wreck. But it is more likely that the visor was attached to the ship, when it sank. Today the writer thinks that the starboard damages were caused, when the visor, still attached to the superstructure starboard side, were removed under water after the accident. Explosives were then used. Regardless - the Atlantic lock and the two side locks (and the starboard manual lock) could hardly have been ripped off simultaneously by one and the same vertical upward wave impact. You need at least two big impacts, P and P1, one after the other, P damaging the Atlantic lock, and P1 damaging the side locks, and there are many testimonies 2.1 about two bangs just before 01.00 hrs. But these bangs can hardly be associated with the visor locks collapsing, because soon after the ship suddenly heeled >30 degrees to starboard, then came upright and finally reached a stable condition with about 15° list while rolling. How could the side locks have broken? When did the Commission actually discuss that subject? Not until the ninth meeting of the Commission at Helsinki on 31 January and 1 February 1996 (act A162*) the Finnish delegation announced that they had done full scale tests of the side locks and measured a break load of 214.5 tons for one lock! According to the calculations above you then needed an outside load of P1 >500 tons to pull them apart. In order for the statements of the Commission in 1994 and in the Final Report in 1997 to be correct, you thus need an initial impact P - 360 tons - to break the Atlantic lock and then another impact P1 - >500 tons - to damage the side locks. According the Commission it could have been up to ten minutes between the impacts - first an impact P at 00.55 hrs, and then another impact P1 at 01.05 hrs without the crew reacting. But according to the model tests, 3.7 and Appendix 2, there were impacts >300 tons every minute! These model tests are strange, certainly falsified due to incorrect extrapolation of full scale forces from model data - does actually 300 tons impact forces, P and P1, hit a ferry like the 'Estonia' every minute - in 4,2 meters waves? Survivors were alleged by the Commission to have heard repeated metallic noise from the bow for ten minutes before the accident - listing but they never heard any wave impacts. So there were no wave impacts - there were metallic noises, we are told! But the ship's crew did nothing. Metallic noise is quite different from a wave impact. The latter is heard as canon shot followed by vibrations. The reader should by know that any allegation by the Commission about wave impacts on visors are pure imagination. Two ships of the writer have been hit by freak - unexpected, steep and high - solid waves in heavy weather causing severe damages. One cargo ship was suddenly rolling into the freaksolid wave, which ripped off 50 metres of bulwark on the weather deck and damaged hatch covers and a crane. The bang was immediately heard and the damage noticed and the ship changed course to a port of refuge. A freak wave on the other ship rolled over the stern and impacted and damaged the deck house aft side - it was pushed in 10-20 centimetres - and smashed windows and doors and the 1st tier of the deck house was water filled. The impact was evidently heard and the ship changed course, etc. It is strange (evidently the Commission just made up an untrue story!) that the crew on the 'Estonia' never noticed anything suspect before the ship suddenly listed (at 01.02 hrs or 01.15 hrs). According to the model tests Appendix 2 there were very big impacts every two-three minutes but on the ship only two big bangs were noticed - then sudden listing - and a stable condition at reduced list. (vii) the ramp hydraulics and preventer wires. Only then the ramp can be pulled fully open around its hinges on deck 2 by a forward force (the lose visor? ), so that water can fill the car deck in the superstructure after which the ship capsizes and floats upside down. All these structural damages must take place before the visor can fall off under way without anybody onboard noticing anything. 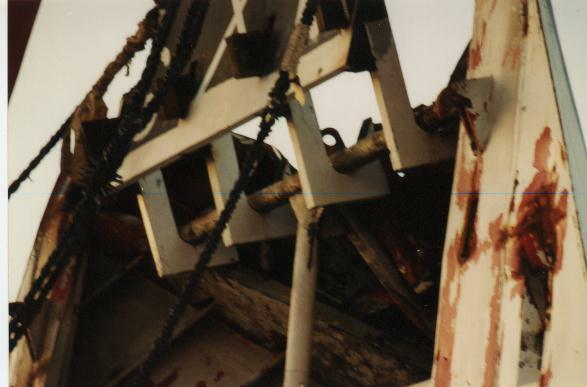 The Commission has not presented any evidence for any damages except the hinges - only some blurry photos taken 4 October 1994. The analysis of alleged (invented by the Commission) damages thus continues.